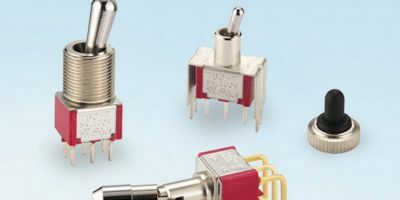 The Salecom range of high quality panel mounting miniature toggle switches is available from specialist distributor, JPR Electronics. They can be used in industrial, commercial, telecomms, test, aerospace instrumentation, medical equipment, networking products and consumer goods, advises JPR Electronics. Salecom miniature toggle switches have a 10.41mm actuator length and are available in single pole single throw (SPST) and double throw double pole (DPDT) versions. Contact forms include on-off, on-on and on-off-on. Momentary action biased versions are also available. This latest offering, the Salecom T80-T series, is rated to 5A 120V AC/28V DC 2A 240V AC and has an operating temperature range -30 to +85 degrees C. Contact resistance is up to 10mOhm (maximum initial) and electrical life is 50,000 make/break cycles at full load. The body material for the miniature toggle switches is diallyl phthalate (DAP) with silver-plated contacts. They are UL-approved and RoHS-compliant. Salecom Electronics was established in Taiwan in 1976 and designs and manufactures a range of switches, supplying leading OEM brands worldwide. The factory is ISO9001, TS16949 and ISO14001 -certified and products carry UL, CSA, ENEC, TUV and CQC quality assurance approvals. The complete Salecom switch range consists of high-quality toggle, rocker, slide, pushbutton, tact and key switches, dip switch, micro switch and illuminated switches. Salecom products are available in many variants from ultra-miniature and sub-miniature to miniature, with versions available for through hole and surface mount assembly. Switches are available sealed, washable and dustproof depending on the product. JPR Electronics was established in 197 as a progressive and dynamic supplier of electronic components and accessories to manufacturers, sub-contractors, designers, distributors, MOD, government departments and educational establishments. JPR is an independent distributor with a global network of franchises, enabling the distributor to offer an extensive range of products from recognised quality manufacturers. All stocked lines are despatched the same day with carriage free on all orders over £30.